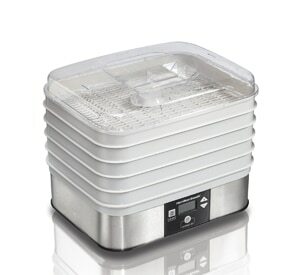 You need a good quality food dehydrator if you want to preserve vegetables or fruits for an extended period. You can become addicted when you begin enjoying the dehydrated snacks! The best part is that you can control the meals you want to dry, their flavors, tastes, and thickness. In this Nesco appliance, you can dehydrate meats, seeds, herbs, nuts, vegetables and fruits making them crispy as you desire and skipping the sodium, excess salt, preservatives and additives. It has a lot of great features that you won’t find in other models. If you want to dry an immense amount of food for your family and friends, then this unit is the perfect choice for you. You can expand this great dehydrator to a massive twenty trays. With a digital programmable timer that is included, you don’t need to check your meal every thirty minutes. In just a couple of hours, this appliance can turn the flank steak that is juicy into the amazing beef jerky thanks to its power of 1000 Wats. This great dehydrator is perfect for the beginners and as a starter unit. It is an excellent way to make tasty and healthy snacks and to cut down on your kitchen food waste. Your children will love delicious veggie and fruit chips, fruit leather, and jerky. We made a list of useful features that come with the Nesco FD-1040 Dehydrator. Keep reading to find out more about its advantages. This dehydrator comes with the Converga – Flow that is a typical airflow mechanism which will prevent water to drip on the heater that is below. It is patented to force the heated air horizontally across each tray after it goes through the outer chambers. That will keep flavors from combining and the food will dry faster than usual. The fan that is 4,5 inches is coupled with the powerful motor making the appliance 4 times faster than other units which sizes are comparable. Depending on the thickness beef jerky can take four to five hours, while fruit rolls can be ready in just three to six hours. To get the best results you will need to experiment with the heat, but you will notice that this dehydrator is faster than the other ones. For an adequate food drying your unit needs to include a powerful fan so it can dehydrate your food correctly. The heat will be distributed evenly inside the appliances chamber when there is an air circulation that is good. This unit has an adjustable, automatic thermostat that ranges from 90 to 160 degrees F. When it is combined with its airflow mechanism, you will be able to dry a wide range of food safely and evenly. For example, you will need a high temperature to make vegetables and fruits and also a beef jerky. Bear in mind the water content in different types of meals you want to dehydrate when choosing the perfect temperature. 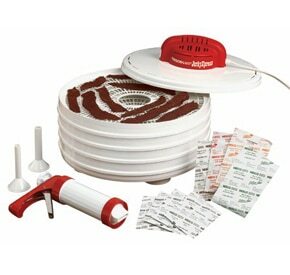 The nesco dehydrator will dry food faster thanks to a high wattage heater. Instead of a couple of days, it will dehydrate a different quantity of meals in just a few hours. For example, dehydrating bananas take five to eight hours while apples will be ready in about four to six hours. It could take more than twelve hours to dry bananas and apples with some other dehydrator. You will also be able to make the beef jerky in just four hours. This appliance comes with the temperature control thermostat ranging from 90 to 160 degrees F. You just need to set the right temperature for the various type of food. The best part is that you can dry meat, vegetables, and fruit rolls and preserve their nutritional values. If you are the type of person who wants their dehydrator to have a pleasing design, you will be satisfied with its look. But, the opaque exterior serves as essential function – more nutrients can be locked inside the unit’s chamber because it blocks out the exterior light. Since the dehydration process is made to preserve both the nutrients and flavors, this is an important aspect of it. Each tray is 15, 5 inches in diameter and there is four of them. You can expand your unit to twenty more. The air pressure and airflow control will adjust automatically to the new number of trays. Each of them can dehydrate one sq ft of foods, and they do not rotate. Users can program the digital timer for 48 hours of dehydrating. According to your convenience, use its functions to schedule the process of drying. This unit is a stackable, top mounted appliance that comes with a digital unit. It is known as the high-quality product because of its appealing aesthetics, faster drying process, larger capacity and higher watts. This dehydrator uses Converga Flow patented technology that will provide even and better drying process. The Nesco FD-1040 dehydrator comes with the temperature control thermostat ranging from 90 to 160 degrees F. Just set the right temperature for the different type of food. 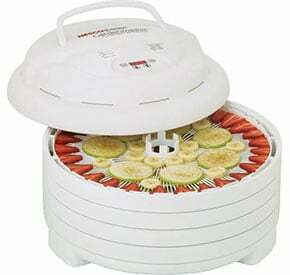 This great dehydrator comes with the four trays, and you can expand it to twenty more. Users can program the digital timer for up to 48 hour of dehydrating. From the date of original purchase this unit is warranted for one year, against defects in workmanship and materials. It doesn’t cover an accident or similar incidents, misuse, and transportation damage. We liked a lot about this product since it is one of the better ones in its price range. So, we decided to make a list of the most notable advantages. Its price is very reasonable. Even those with a low budget can purchase it and enjoy its incredible features. This dehydrator is very fast. In just a couple of hours, it can turn the flank steak that is juicy into the amazing beef jerky. It will dehydrate vegetables, fruits, and meats in just a couple of hours. The Nesco appliance comes with the programmable digital timer, so you don’t need to check your meal every thirty minutes. It is a great option when you are a busy parent. The unique nesco dehydrator’s technology will provide faster and evenly drying process. Its exterior plastic body and airflow mechanism allow for tastier and healthier snacks. After you are done using this unit, it is essential to clean it up. Because you can place it trays in the dishwasher, it will be easy for you to clean it. The great thing about this product is that it comes with the different recipes you can use with this particular appliance. The maximum number of trays is twenty, and that means this appliance has a large capacity. Each of them can dehydrate 1,5 sq ft of meat, which is excellent option when you have a large family or love to call your friends to your dinner parties. The bad thing about this dehydrator is that it includes only four trays. That will not be enough for you if you want to dry significant amount of food. So, if you want more trays, you need to purchase them separately. The good thing is that this unit dries veggies, fruits, and meats faster than others, but the bad news is that it also increases the consumption of power. You need to be extra careful when cleaning the trays because they are fragile. Make sure to do that after every use. The dehydrator’s fan after some use tends to get stuck or breakage. After a few years and heavy or moderate usage, the Nesco unit begins to show some issues. If you are looking for a dehydrator that is suitable for home use and has a large capacity, then Nesco FD-1040 Gardenmaster is the perfect choice for you. You can dry as many or as little of preferred vegetables, fruits or meats by adding or subtracting the number of trays. In a lesser time, you can dehydrate a larger amount of food thanks to its powerful engine. We hope that this review was useful and helpful for you to make a more informed decision.